If experiencing the luxury and comfort of an ocean-front home in Cabo San Lucas has always been a dream of yours, make it a reality at the spectacular Villa La Estancia Cabo San Lucas. 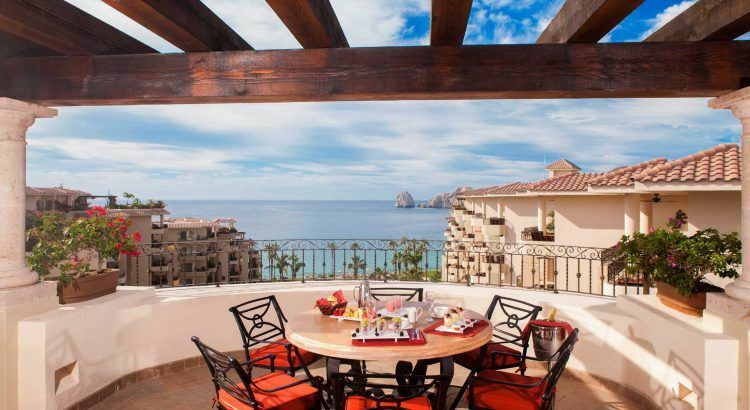 The prime Cabo property boasts 156 luxury-appointed villas designed in a rich colonial-hacienda style combined with contemporary amenities such as fully equipped gourmet kitchens featuring stainless steel appliances and granite countertops. With a selection of penthouses, 3 bedroom and 2 bedroom villas to consider, you will certainly find the perfect fit for your needs and lifestyle. Just imagine the scene … a welcoming hacienda-style gate leads you to a handsomely designed front door made from maple wood. The magnificent feel of the lavish interiors, which include a stately living room in addition to grand dining and entertainment areas, is taken to new heights with ten foot ceilings. To ensure you find your new home in Cabo as comfortable as possible, there is high-speed internet satellite TV, a washer/dryer and climate control with central air-conditioning. The breathtaking views of the ocean will amaze you, even when you catch a glimpse through sliding doors and windows with double-glazed tempered glass which lead out to your palatial balcony or terrace. The gorgeous cabinetry throughout is made from hardwood maple and you will feel like a king with marble flooring. Bedrooms with en-suite bathrooms boast opulent extras like spacious walk-in closets, large travertine marble showers, whirlpool tubs, dual vanities and marble countertops. Once you get a taste of these features when you check out our villas for sale, you will be spoiled forever! The sensational Penthouse Suites give you ample room to stretch out, with 4,326 square feet of amazing space to treasure. With two master suites, each with a king size bed and en-suite bathroom, and a guest bedroom with two double beds, you can be sure there is a quiet escape for everyone when they are ready for some downtime. While the sumptuous indoor areas are splendid in their own right, the outdoor living space of the Penthouses is an absolute highlight, featuring a top of the line grill, a Jacuzzi and a fire pit upon a vast terrace which will allow you to soak in the immense beauty nature has to offer. The Three-Bedroom Suites have 2,769 square feet of masterfully designed comfort, with two master bedrooms each with generous spa bathrooms. The indoor areas open to a large terrace where you will find a wet bar to make any occasion just a bit more festive and you can enjoy the outdoors any time of the year. You will find everything your heart could desire within the 2,166 square feet of the opulent Two-Bedroom Suites. The master bedroom has a king size bed with an en-suite spa bathroom, while a second bedroom has two queen size beds. Of course, you’ll want to spend some time on your terrace to take advantage of the outdoors, too. Who can resist those Cabo sunsets. Want to find out more about Villas for sale at Villa La Estancia Cabo San Lucas? Call us on: 1 877 499 1901< or arrange a try and buy trip to see for yourself.